Good music makes you nod your head and tap your feet. It can be as simple as a guitar, piano, violin or a drum beat. Great music is deeper. It makes you relate to it. It brings back memories of your past. It reaches you. It makes you feel....good or bad. It gets down into your soul. 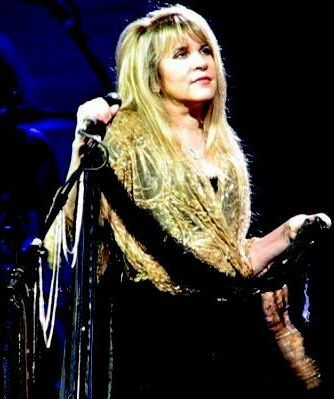 The above lyrics are from Fleetwood Mac's "Gold Dust Woman", written by Stevie Nicks. The song appeared on their "Rumors" album in 1977...forty years ago. The album detailed the breakdown of personal relationships within the band. When I heard the song played live last Sunday, during Nick's concert, at Ravinia, it brought me back to almost every relationship in my life. Every. Single. One. I imagine a lot of the concert-goers were thinking the same thing. It's not easy but we move on. We pick up the pieces. We go home. Circle of life. Circle of life crap isn't easy and it's not supposed to be. You could feel it just by looking at these two women and picturing their lives. It made me think of my daughters and how they've moved on to new lives. I know we weren't the only ones. I've been singing this lyric in my head for two days. Stevie Nicks wrote this song when she was in her early twenties. She's now sixty-nine. I'm just a bit behind her. Yep, the children did get older...and we got older, too. Yep, great music gets you into your soul.